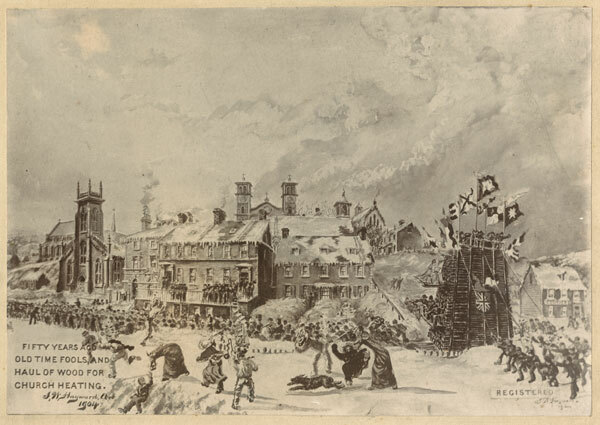 In Newfoundland the tradition of mummering or jannying (December 26 – January 6) is often associated with the mummer’s parade, home visitation, music and the occasional drink! The tradition has a darker side. Few people know that in order to mummer in Newfoundland participants at one time needed a license to do so and that for almost 100 years mummering was outlawed!! The idea of a license to mummer did not go over very well. Mummering was a passion ingrained in the culture of the Newfoundland people. The St. John’s newspaper the Public Ledger in January 1862 suggested that 150 licenses had been issued during the preceding Christmas season, but that many more participants in the custom had failed to comply with the new legislation. The Rooms is dressed for Christmas – come take a look at our Christmas trees! We have a special “mummers tree”. This entry was posted in Archival Moments and tagged disguise, Harbour Grace, jannying, masked, Mummering, mummers, Nichols on December 27, 2018 by Larry Dohey. St. Stephen’s Day (known nowadays as Boxing Day) is a significant date on the Newfoundland calendar. 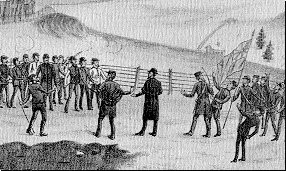 It was on St. Stephen’s Day in 1883 on which the Harbour Grace Affray took place. On St. Stephen’s Day, 1883, the hostility that was forming in the town of Harbour Grace between the Protestants and Roman Catholics came to a boiling point. Approximately 400 – 500 members of the Loyal Orange Association held their annual parade through the town. It was during their march around the town that a group of 100 to 150 Catholic men from Riverhead formed a line in an attempt to prevent the Protestants from passing through the lane from Harvey Street to Water Street because they felt that the Orangemen were encroaching on their territory. From this confrontation came five deaths and 17 injuries. Resulting from this event, known as the Harbour Grace Affray, nineteen people were arrested and brought to trial. Due to conflicting evidence and suspected perjury, all charged individuals were acquitted. Recommended Archival Collection: The Rooms Provincial Archives: GN 170 Newfoundland and Labrador Court Records: Files consist of charges relating to the Harbour Grace Affray. Recommended Reading: The Harbour Grace Affray: St Stephen’s Day 1883 by Patrick Collins, DRC Publishing, St. John’s, NL, 2011. This entry was posted in Archival Moments and tagged Affray, Boxing Day, Harbour Grace, St. Stephen's Day on December 26, 2018 by Larry Dohey. In Newfoundland the tradition of mummering or jannying is often associated with the mummer’s parade, home visitation, music and the occasional drink! The tradition has a darker side. This entry was posted in Archival Moments and tagged disguise, Harbour Grace, masked, Mummering, Nichols on December 28, 2017 by Larry Dohey. Old Word: Affray: person is guilty of affray if he uses or threatens unlawful violence towards another and his conduct is such as would cause a person of reasonable firmness present at the scene to fear for his personal safety. This entry was posted in Archival Moments and tagged Affray, Boxing Day, Harbour Grace, St. Stephen's Day on December 25, 2017 by Larry Dohey. On June 21, 1928 the prestigious New York Times newspaper declared that Trepassey, Newfoundland would be the site of a great international airport. The headline came about as a result of an interview that Amelia Earhart had with the international press shortly after landing at Burry Port, Wales becoming the first woman to make the Atlantic crossing. Earhart and her crew had departed fromTrepassey, Newfoundland the morning of June 17 landing “across the pond” on June 18. Prior to departure from Trepassey she has spent twelve days in the town meeting many of the local people. Unfortunately for Trepassey no infrastructure was established. In Newfoundland, the town of Harbour Grace became the airport of choice. The Harbour Grace airfield, built on the summit of this hill by the local people became starting point of many early flights from West to East. Amelia Earhart the next time she was in Newfoundland by passed Trepassey that she had spoken so highly about and completed the world’s first transatlantic solo flight by a woman after taking off from Harbour Grace, on 20 May 1932 and landing at Northern Ireland about 13 hours and 30 minutes later. This entry was posted in Archival Moments and tagged airport, Amelia, Earhart, Harbour Grace, Putnham, Trans Atlantic, transocean, Trepassey, woman on June 19, 2017 by Larry Dohey.